This is the third of a 5-part series from guest-blogger, Dr. Dunstan Lowe, who teaches Classics at the University of Kent. “Always Already Ancient” was first published in print in the 2013 volume, Greek and Roman Games in the Computer Age. It is reproduced here by permission of the author and publisher. The original meaning of the Latin word ruina was not something physical, but an event.1 Most classical ruins are structurally damaged. The various forms of the Heritage mode might be said to aestheticize the gradual decay of monumental buildings, it is also possible to aestheticize the effects of violent disaster, and even the actual crisis itself. Many computer games continue to be driven by clichés of action-driven fantasy mainly borrowed from movies and comic books. This brings us to the Destruction mode, in which buildings or objects are turned into ruins “on demand”, so to speak, within the context of the game. Many examples of ruination take place during video clips or “cut-scenes”, which are non-interactive parts of the game. Often the plot and action of a game is initiated or driven on by the wrecking of classical architecture. 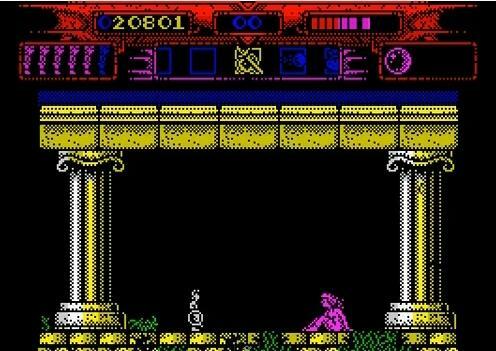 The world of Black & White 2 (Macintosh, PC: 2005), is populated by four tribes, Norse, Japanese, Greek and Aztec, but it is the Greeks whom the player must control in his or her campaign to become the most powerful deity. The first task is to rescue Greek villagers from being wiped out by a huge Aztec army, by plucking them from amidst burning buildings; a column eloquently topples, symbolizing the vestige of former glory with which the player must rebuild their own classical civilization. A different strategy game already discussed above, Rome: Total War, strikes a similar note. The fighting normally consists of pitched battles viewed from above, and it is not possible to destroy settlements, but the introductory movie nonetheless emphasizes close-up siege warfare by showing a wall being smashed apart by fiery missiles. Games like these locate the most graphic portrayals of ruin-making in the least interactive parts of the player’s experience. Specific landscapes can undergo destruction in fantasy scenarios. Sparta and the Colosseum are popular victims, one a highly fanciful representation, the other faithful. The game 300: March to Glory (PlayStation Portable: 2007), based on Frank Miller’s 300 (dir. Snyder 2007), features battered and aged buildings not present in the movie itself, which instead presents a Sparta made of mighty, flawless marble.2 In Spartan: Total Warrior (GameCube, PlayStation 2, Xbox: 2005), an equally vast and splendid Sparta is subjected to explosive bombardment by the Romans. The final and climactic level is set in the city of Rome itself, which is heavily damaged and on fire. In a failed assassination attempt upon Emperor Tiberius, the hero’s friends have freshly bombed the Colosseum from beneath, creating an obstacle course through which the player (as “the Spartan”) must climb as he fights his way towards the arena. Thirteen years earlier, in the arcade beat-‘em-up World Heroes 2 (1992),3 another mint-condition Colosseum is transformed by sudden and heavy violence in the very same fashion. When this environment (representing Italy on the globe) is first seen, it is in such pristine condition that it even features a towering Colossus, modeled upon its resident champion (the alien Neo Geegus).4 Once this opponent is defeated, the next and final enemy (Dio, another alien) arrives, heralded by a shower of lightning which wrecks both Colossus and Colosseum. When the player reaches the end of Asterix for the Sega Master System (1991), Obelix falls through the air onto Asterix’s head so heavily that part of the Colosseum collapses into rubble (perhaps suggesting that this is how the structure reached its present shape).5 The opening, the climax, and the conclusion of the overall game experience seem to be the preferred moments for passive viewing experiences of this kind: they shape the player’s enjoyment by giving it cinematic qualities. Hollywood epics provide the model for the destructionscenes of famous classical scenery, both before and after: the spectacular destruction of spectacular monuments turns one kind of majesty into another. When destruction is performed by the player him- or herself, the experience becomes very different. Myth: History in the Making already yielded bonuses to players in 1989 for destroying the Greek statues in its second level, but in more recent games, such acts have become both more common and more graphic. Kratos, the action hero of the God of War series, frequently inflicts extreme violence upon the monuments (as well as the inhabitants) of a mythologized ancient Greece. In God of War: Chains of Olympus (PlayStation Portable: 2008), Kratos topples and smashes a statue in order to extract the Gauntlet of Zeus that it is wearing. Again, in God of War 2 (PlayStation 2: 2007), Kratos tears an entire 14-column temple out of the ground and pushes it over a cliff, in order to turn its roof into a bridge across an inconvenient river of blood.6 Inventive versions of classical culture (especially myth) seem particularly amenable to the frequent and violent creation of ruins, because their classical architecture can be freely and repeatedly generated. Rygar: The Legendary Adventure (PlayStation 2: 2002) is another case in point. The part-mythical, part-historical scenario places the eponymous champion gladiator on the island of Argos, a dominion of Rome (which has also recently conquered Egypt). Ruin-making moments in this game are too numerous to catalogue, but the introductory movie is a good illustration. The first few seconds show statues, shrines and a triumphal arch being destroyed, and before Rygar’s Diskarmor weapon has struck three blows it has smashed a stone column. Like Myth and many other games (including the God of War series), this game places bonuses within breakable vessels, thus encouraging the player to destroy them on sight. The pleasure this provides is presumably even greater when the protagonist is a time traveler from the present. This is the case in two different specimens of the “first-person shooter” style of game, in which players explore and depopulate environments behind the barrel of a gun. 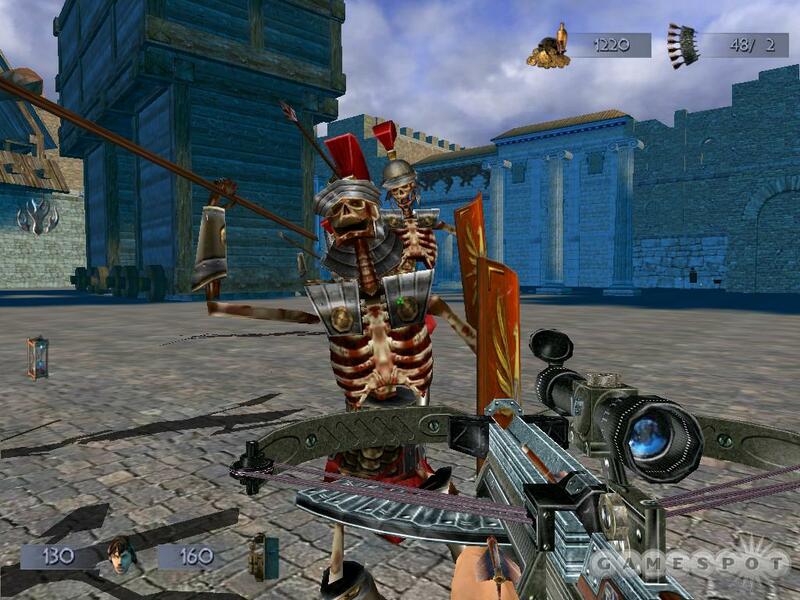 In Serious Sam: The Next Encounter (GameCube, PlayStation 2: 2004), the eponymous hero is thrown into a series of notionally ancient Roman locations, from “Cicero’s Villa” to the “Colosseum”, as he pursues an enemy through time. On arrival in the first main level, the player is standing between four stone statues. These provide an immediate incentive for destroying artifacts: shooting them to pieces reveals a piece of treasure. Will Rock (PC: 2004) is set in the modern world, but inside a supernatural city where the Greek gods were imprisoned by the conquering Romans. It provides similar hidden rewards, except that very early on in this game, the player is required to destroy rows of large red-figure vases in order to reveal a key and progress into the next room. Ironically Will, the hero, is a junior archaeologist, who can fight hand-to-hand with a spade. In his guise, the player is compelled to destroy relics rather than preserve them—in fact, many of the enemies are animated marble statues which attack Will on sight. Reducing antiquities to rubble is not always something that the player witnesses passively, as a spectacle. It can be an active encounter that is tolerated, encouraged, and in some cases even required. However, those games which permit repeated acts of destruction do so within heavily fantasized scenarios, suggesting that computer game players and designers would be less comfortable with imagining vandalism upon real-life antiquities. 1. Oxford Latin Dictionary, s.v. ruina; cf. ruo. 2. 300: March to Glory is not the only game based on a movie which amplifies the element of ruination. Near the climax of Disney’s Hercules (dir. Clements & Musker 1997), a giant, one-eyed Titan begins destroying the city, and a single collapsing column kills Meg. In the game version, Level 7 consists entirely of Hercules running and leaping through a near-endless rain of collapsing columns. 3. “beat-‘em-up (also known as brawler) is a video game genre featuring melee combat between the protagonist and an improbably large number of underpowered enemies.” Cf. http://en.wikipedia.org/wiki/Beat_’em_up. 4. The historical Colossus, modeled on Nero as Apollo, was erected in the vestibule of the Golden Palace and gave its name to the nearby Colosseum. 5. If so, this would be in keeping with a tradition of historical in-jokes in mass media, in which famous examples of damage to classical remains are given humorous explanations. The loss of the Venus de Milo’s arms has been “explained” many times in cinema and television (e.g. Carry on Cleo, dir. Thomas 1974; Les Douze Travaux d’Astérix, dir. Goscinny et al. 1976; Disney’s Hercules, dir. Musker & Clements 1997; Hercules: The Legendary Journeys episode 3.18, first broadcast 1997). 6. 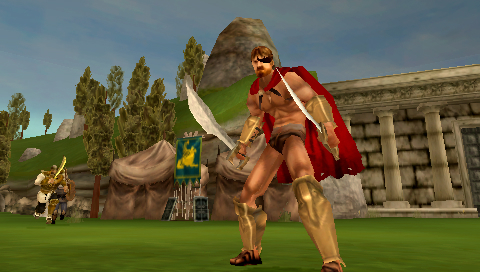 Examples of the Destruction mode are even more numerous in Gameloft’s homage to God of War for mobile devices, Hero of Sparta (iPhone: 2008), and in its sequel Hero of Sparta II (iPhone: 2010).